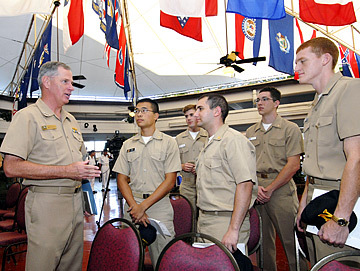 Vice Adm. Barry Costello, who commands the Navy's 3rd Fleet, met with six third-year midshipmen who hope to sail in submarines during the close of Rim of the Pacific naval war games on Friday. Officials should use science, not opinion, when deciding whether to allow naval combat vessels to use active sonar in future war games, says a top Navy commander. A lawsuit filed by environmentalists, along with other sonar restrictions, resulted in the loss of anti-submarine "training opportunities" this month, said Vice Adm. Barry Costello, commander of the Navy's 3rd Fleet and Rim of the Pacific naval war games that ended Friday. Costello said the Navy was prevented from using active sonar for a couple of days after a federal judge in Los Angeles granted a temporary restraining order. Environmentalists had argued that the sonar is harmful to whales and other marine mammals. "In the overall perspective of the exercise, we accomplished all our tasks and goals that we wanted to achieve," said Costello, who commanded more than 19,000 military personnel and 35 RIMPAC warships. As planning now begins for the 21st RIMPAC, to be held in the summer of 2008, Costello urged that "whatever we do, as far as on this issue, that we base it on science and that we base it on what we can learn about the ocean and how sound travels; whatever measures we put into effect are based on some sound scientific evidence, as opposed to strongly held opinions." Costello told the Star-Bulletin that the Navy had invested a lot of money in research in this area, and "we want to work with the environmental community to come up with the right answers. "We just don't want to be constrained based on no factual basis." Costello said his goal is "to achieve a balance -- being a good environmental steward, which is very important to me, as well as being able to make sure that when I send my sailors in harm's way, they are properly trained, they are able to use active submarine to find potential enemy submarines." Costello said he had received no reports of problems with marine mammals in the Hawaii training area, although there were many sightings of them during the exercise. This year's naval war games also were affected by the North Korea missile crisis. The destroyer Kirishima, one of four Japanese ships equipped with special Aegis radar equipment and located in island waters for anti-ballistic missile testing off Kauai in June, as well as for RIMPAC, was recalled as North Korea prepared to test-fire ballistic missiles. It joined four other Japanese and U.S. Aegis destroyers to patrol waters off Japan, to try to detect and track possible missile launches, Kyodo News Service reported. Rear Adm. Sansei Izumi, who commanded the four ships, one submarine and eight P-3 Orion subhunter aircraft participating in RIMPAC, told reporters Friday that the early departure of the Kirishima had forced him to change some of the training events that were to be held with U.S. forces. It was the 14th time Japan has sent sailors and warships to RIMPAC. The United Kingdom has been a RIMPAC participant 13 times; South Korea, nine; Chile, eight; and Peru, two. Many of the RIMPAC exercises involved searching by sonar for the three diesel submarines brought to Hawaii waters by Japan, South Korea and Australia to help coalition and U.S. sailors become proficient in tracking them. All of the subs in the U.S. fleet are nuclear-powered. For the first time in the 20-year history of the naval war games, the U.S. Navy had to obtain a permit from the National Oceanic and Atmospheric Administration, which detailed areas around the islands where active sonar could not be used. The warships in the RIMPAC exercise also had to reduce sonar power by six decibels if a marine mammal were spotted within 1,100 yards of a ship, by 10 decibels within 550 yards, and could use no sonar within 220 yards of such an animal. The permit covered only this year's RIMPAC exercise. In addition, in early July, just before the start of the war games in which anti-submarine warfare and active sonar were to play key roles, a federal court issued a restraining order saying that use of midfrequency sonar posed an unnecessary and avoidable threat to marine mammals and violated two fundamental environmental laws: the Marine Mammal Protection Act and the National Environmental Policy Act. A few days later, the Navy agreed to further restrictions on sonar use. The Navy has consistently argued that many factors cause whales and other marine mammals to become stranded, including pollution, disease, starvation and collision with ships. It maintains that it has used sonar in its RIMPAC exercises for the past 20 years without marine mammal stranding being attributable to the underwater noise. Environmentalists, however, attributed the stranding of more than 150 melon-headed whales in Hanalei Bay, Kauai, two years ago to a RIMPAC exercise taking place at the time. An April report by the National Oceanic and Atmospheric Administration said naval sonar might have prompted the whales, which are normally found in deep water, to seek refuge in Hanalei Bay, but there was no conclusive proof.